A thesaurus (plural thesauri or thesauruses) is a book of words collected together according to meaning and similarity. In other words, words grouped according to semantic field. Compare this to a dictionary which lists words alphabetically and then gives their meanings. 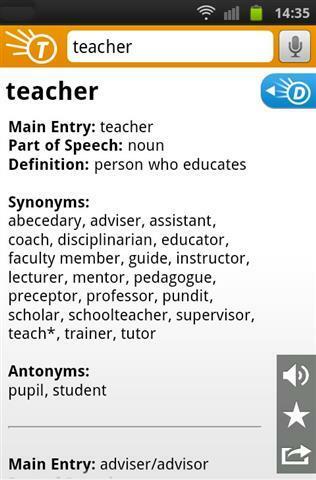 teacher noun someone whose job is to teach, especially in a school. Kinds of teacher include: adviser, coach, college lecturer, counsellor, crammer, dean, demonstrator, deputy head, doctor, don, duenna, fellow, form teacher, governess, guru, head of department, head of year, headmaster, headmistress, headteacher, housemaster, housemistress, instructor, lecturer, maharishi, master, mentor, middle school teacher, mistress, nursery school teacher, pastoral head, pedagogue, pedant, preceptor, preceptress, primary school teacher, principal, private tutor, professor, pundit, reception teacher, school-ma’am, schoolmaster, schoolmistress, schoolteacher, secondary school teacher, senior lecturer, student teacher, subject co-ordinator, supply teacher, trainer, tutor, university lecturer, upper school teacher. Both examples above were taken from the online Chambers dictionary. Although there had been thesauri before, the first major modern thesaurus was compiled by Peter Mark Roget who, in 1852, published Roget’s Thesaurus. Unlike a dictionary in which words are listed alphabetically, Roget’s is grouped by concept starting with abstract concepts such as existence and state and then moving on to quantity, order and suchlike and to action, volition and belief. The word thesaurus comes originally from the Greek‏‎ θησαυρός literally meaning treasure store, which generally meant a store of valuable items. Today the word is used almost exclusively to describe the book.